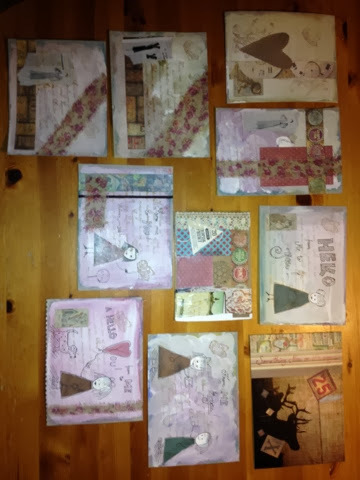 I have had a fantastic time creating postcards for iHannas postcard Swap. Here is my collection! Not a very good picture I'm afraid but still! So grateful there are terrific people like Hanna that host creative things like this! Aww, thanks Kirsi! So glad you wanted to join! I love them, I would love to receive one! Thank you so much, Chi, glad u like them! Kirsi, thank you so much for your iHannah Postcard! I received it today in Seattle, WA! I love your use of lace and the layers of papers! Hi Kirsi! Thank you for your beautiful postcard! The colors have sort of an autumn feel to it :) Lovely background and I like the frog on there. And I just wanted to say: Your handwriting is very pretty! Hi Kirsi!!! I love the postcard!!! It's soo neat!!! You are so creative!!! Hope you have a joyous holiday season!! !